In an advance that could lead to improved manufacturing, a new study by UCLA researchers shows that adding nanoparticles to metals during the melting process allows for better control during melting. The melting and solidification of metals are important processes in manufacturing, used in welding and also 3-D printing. For example, laser welding has been used to build cars and ships for decades. However, the researchers suggest that improvements in melting/solidification processes could have financial benefits resulting from increased efficiency and reliability. There are two important “zones” in a metal during melting. The first is the “melting zone,” where the metal turns into a liquid, which allows it to be spread and shaped as desired. The second is the “heat-affected zone.” In this adjacent zone, the metal is not molten, but its microstructure could deteriorate from the heat. The larger a melting zone is, the larger the nearby heat-affected zone is. However, for manufacturing, the opposite effect is actually desired. A deep and maximized melting zone coupled with a corresponding minimal heat-affected zone would allow for a high-quality melted region, while lowering susceptibility to potential defects in the adjacent area. 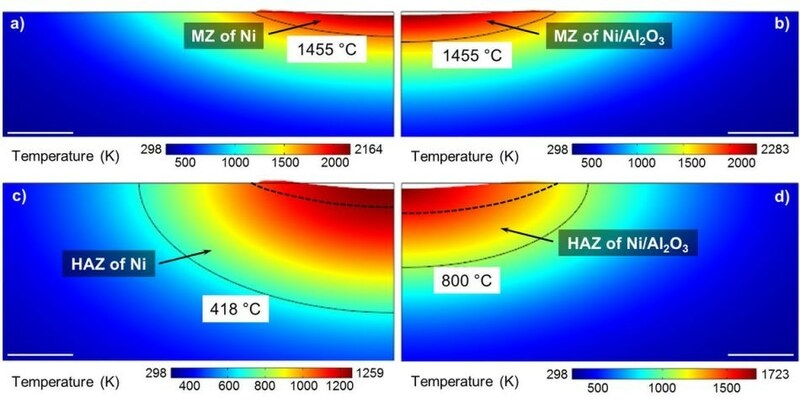 The team, led by Xiaochun Li, professor of mechanical and aerospace engineering at the UCLA Henry Samueli School of Engineering and Applied Science, showed that by adding nanoscale particles of aluminum oxide during a later melting of nickel, they could increase the depth of the metal’s melting zone by 68 percent, while decreasing the heat-affected zone by 67 percent. Adding nanoparticles of silicon carbide showed similar results. The research was published today in Nature Communications. “Our discovery of the unusual melting and solidification of materials containing nanoparticles will not only have immediate impacts on existing melting and solidification manufacturing processes, but also on other applications, such as pharmaceutical processing and energy storage,” said Li who holds the Raytheon Chair in Manufacturing Engineering. The added nanoparticles reduce heat dissipation during the melting process, Li said, making a melted zone that is deeper, while the heat-affected zone is shallower. There are two physical mechanisms that make their nanoparticle-assisted process work, Li said. First, the nanoparticles reduce the thermal conductivity, therefore decreasing conductive heat transfer to the rest of the material — essentially, they trap more heat in. Second, the nanoparticles increase viscosity in the melted zone, which suppresses what’s known as thermocapillary flow. This also slows the heat transfer from within the melted zone. Li added that the control of microstructures by nanoparticles will impact various existing processing technologies, such as welding and 3-D printing, where the deterioration of the microstructures and material properties of heat affected zone is a serious problem that limits the performance of the components. “For example, this could be used to improve the fabrication of lightweight, high-performance parts, such as airplane wings and wind turbine blades, or making precision components like mechanical gears,” Li said. The others authors on the paper are Chao Ma, an assistant professor of manufacturing and mechanical engineering technology at Texas A&M University; Lianyi Chen, an assistant professor of mechanical and aerospace engineering at the Missouri University of Science and Technology; and Chezheng Cao, a UCLA doctoral student in materials science and engineering advised by Li. Ma and Chen are former members of Li’s UCLA Scifacturing Laboratory.